We are a leading Manufacturer of isoprenaline hydrochloride, ceftazidime, levothyroxine sodium, dibucaine, ciprofloxacin and tamsulosin hydrochloride from Vapi, India. Isoprenaline Hydrochloride (51-30-9) is white solid. it is also known as Isoprenaline Hcl, Isoproterenol Hydrochloride and Isoproterenol Hcl. Storage: Keep container tightly closed. Keep container in a cool, well-ventilated area. 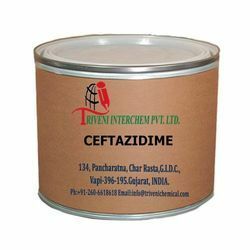 Ceftazidime 72558-82-8 white powder. it is use in Intra-abdominal infections, lower respiratory tract Industry. Storage: Keep container tightly closed. Keep container in a cool, well-ventilated area. Waste Disposal: Waste must be disposed of in accordance with federal, state and local environmental control regulations. Levothyroxine Sodium (25416-65-3) is solid. It is also known as sodium levothyroxine. it is use in hypothyroidism and thyroid hormone Industry.Levothyroxine Sodium (25416-65-3) is solid. It is also known as sodium levothyroxine. it is use in hypothyroidism and thyroid hormone Industry. Dibucaine (85-79-0) is solid. It is also known as Cinchocaine. it is use in insect bites insect bites and stings and hemorrhoids Industry. Storage: Keep container tightly closed. Keep container in a cool, well-ventilated area. Waste Disposal: Waste must be disposed of in accordance with federal, state and local environmental control regulations. Ciprofloxacin (85721-33-1) is light yellow powder. it is use in Bone and joint infections, urinary tract infections, respiratory tract infections and Intra-abdominal infections Industry.Ciprofloxacin (85721-33-1) is light yellow powder. it is use in Bone and joint infections, urinary tract infections, respiratory tract infections and Intra-abdominal infections Industry. Tamsulosin hydrochloride (106463-17-6) is solid. It is also known as Tamsulosin Hcl. It is use in alpha blockers Industry. Prasugrel (150322-43-3) is Solid. It is also known as Prasugrel base. it is use in blood pressure Industry. Storage: Keep container tightly closed. Keep container in a cool, well-ventilated area. Waste Disposal: Waste must be disposed of in accordance with federal, state and local environmental control regulations. Midazolam Maleate (59467-94-6) is solid. It is also known as maleate. it is use in hypnotic-Industry. Storage: Keep container tightly closed. Keep container in a cool, well-ventilated area. Waste Disposal: Waste must be disposed of in accordance with federal, state and local environmental control regulations. Febuxostat (144060-53-7) is Solid. it is use in chronic gout, hyperuricemia and inhibits xanthine oxidase Industry.Febuxostat (144060-53-7) is Solid. it is use in chronic gout, hyperuricemia and inhibits xanthine oxidase Industry. Ritonavir (155213-67-5) is solid. it is use in antiretroviral, hiv/aids and protease inhibitors Industry. cinacalcet hydrochloride (364782-34-3) is Powder. It is also known as cinacalcet hcl. it is use in parathyroid Industry. Storage: Keep container tightly closed. Keep container in a cool, well-ventilated area. Waste Disposal: Waste must be disposed of in accordance with federal, state and local environmental control regulations. Lopinavir/Ritonavir it is use in hiv/aids and antiretrovirals Industry.It is used in industrial chemical. It is available kind of multiple packaging. Drotaverine (14009-24-6) is solid. it is use in irritable bowel syndrome, menstrual cycle, menstrual periods and cervical spasm Industry.Drotaverine (14009-24-6) is solid. it is use in irritable bowel syndrome, menstrual cycle, menstrual periods and cervical spasm Industry. Diacerein (13739-02-01) is Yelow powder. it is use in joint diseases and osteoarthritis Industry. Storage: Keep container tightly closed. Keep container in a cool, well-ventilated area. Waste Disposal: Waste must be disposed of in accordance with federal, state and local environmental control regulations. Trimetazidine Dihydrochloride (13171-25-0) is Powder. it is also known as Trimetazidine Dihcl it is use in Cardiovascular disease Industry. Storage: Keep container tightly closed. Keep container in a cool, well-ventilated area. Allopurinol (315-30-0) is Solid. it is use in kidney stones, gout and cancer chemotherapy Industry.Allopurinol (315-30-0) is Solid. it is use in kidney stones, gout and cancer chemotherapy Industry. Quinidine (56-54-2) is white crystalline. Storage: Keep container tightly closed. Keep container in a cool, well-ventilated area. Sugammadex Sodium (343306-79-6) is powder. it is use in anesthesia Industry. Storage: Keep container tightly closed. Keep container in a cool, well-ventilated area. Looking for Active Pharmaceuticals Ingredient ?